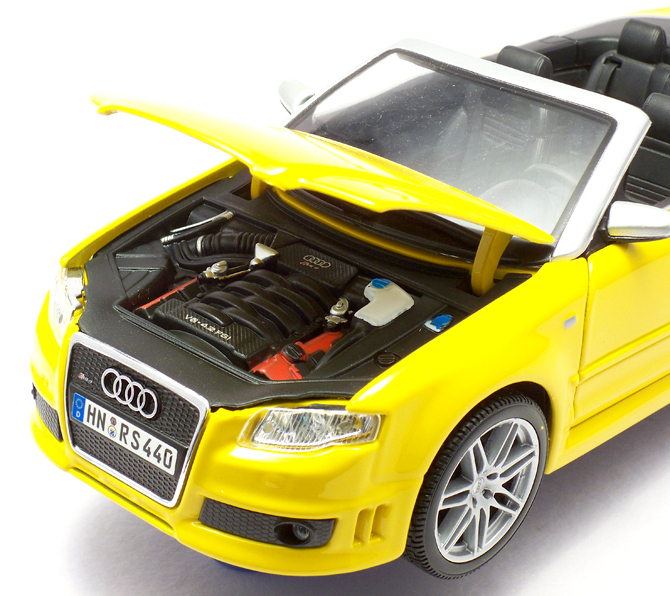 The Audi RS4 quattro is the top tier and high performance version of some specific A4 range of automobiles. It is a sports-focused compact executive car produced by Audi’s high-performance private subsidiary quattro GmbH for the German car manufacturer AUDI AG. Unveiled in February 2005 at Audi’s ‘quattro Night’ celebration at the company headquarters in Ingolstadt, Germany. The “RS” initials are taken from the German words “RennSport” which means “racing sport” and is the Audi’s highest trim level, positioned above the “S” model line-up. Like all Audi “RS” cars, the RS4 pioneers some of Audi’s latest advanced technology, and could therefore be described as a “halo vehicle”. 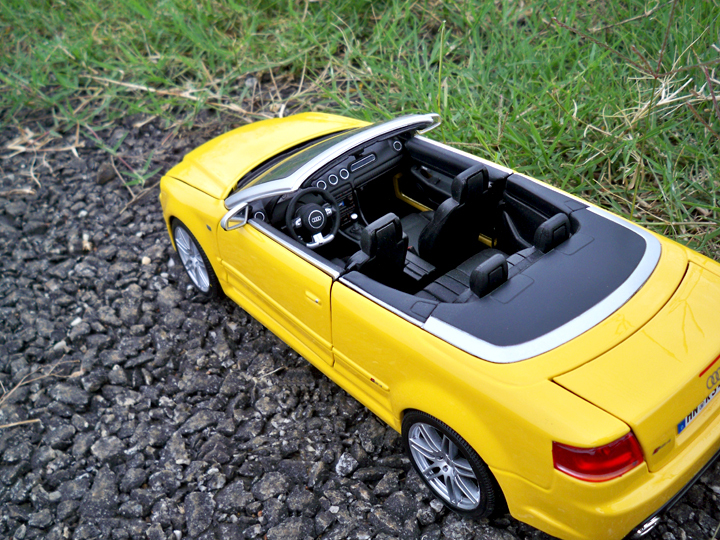 Furthermore, it is only available with Audi’s Torsen-based quattro permanent four-wheel drive system. 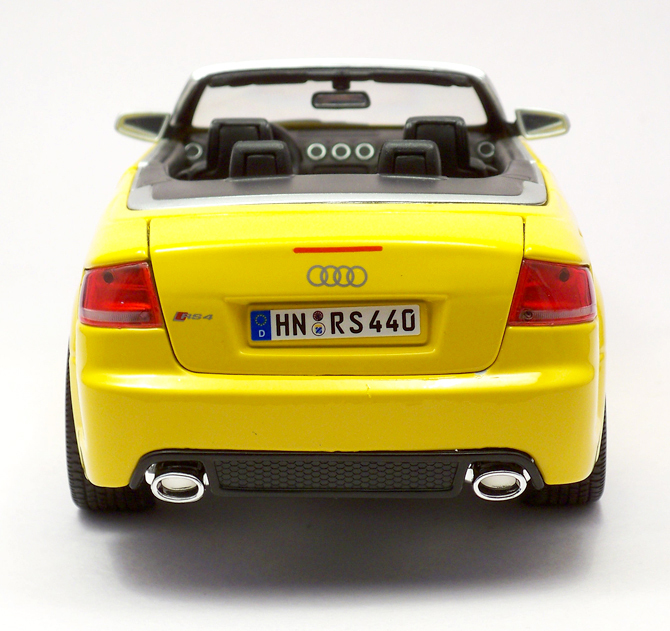 The RS4 Cabriolet what we have here was unveiled in model years 2006 and 2008 in Europe and USA respectively. It features a high-revving 420 horsepower 4.2 liter V8, six-speed transmission, all-wheel-drive, brilliant suspension, and an electronic stability control system tuned by enthusiasts. 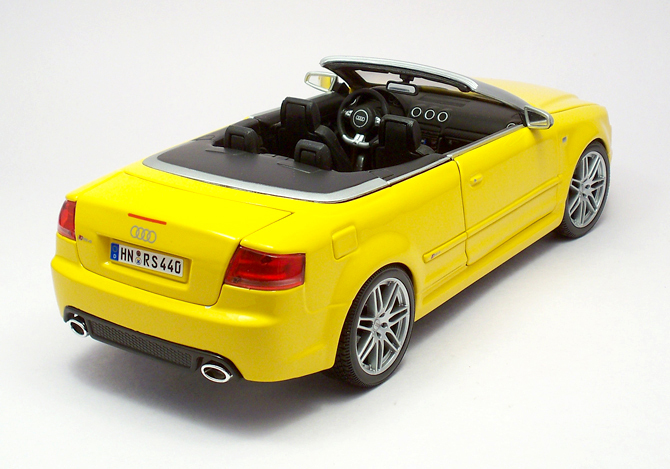 Just as the RS4 sedan translates to “brilliant family car” the Cabriolet translates to nothing but “brilliant convertible”. 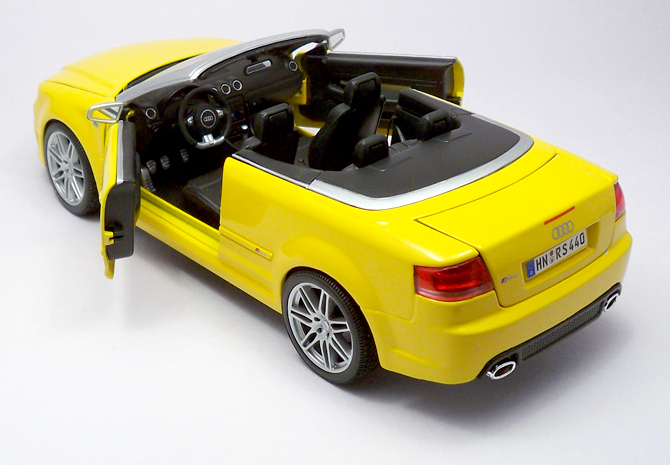 This 1:18 scale model by Maisto looks good from a long distance thanks to the fantastic paint job and the yellow shade itself but fails big time when you get closer. The bodywork is good but the gaps are evident all around. The front quarter disappoints you very badly – the head lamps blunt and misaligned, Audi logo in the grill is HUGE and RS4 badging is tiny! The car look decent on profile view though the scaling is slightly on the larger side which make it look closer to 1:16 scale. The wheels and tires should be given credit here as there aren’t many interesting bit to talk about from this angle. The brake discs are not so detailed but the black caliber with RS4 looks cool. The rear quarter angle is the bestest way to enjoy this car’s beauty. Shut lines a sharp and even the gaps are less almost flush fit in some points. The contour is well maintained and the tail lamps are not bad at all. Logo size is quite large in comparison to the dimension but not as bad as the front, the RS4 badging is neat and smudge free. The car’s black interior is attractive and does a good camouflaging job on the less detailed interiors. The doors use a conventional Maisto’s hinge so the opening is very limited infact narrow. The aluminum accent on the interior is neat and does the job well. 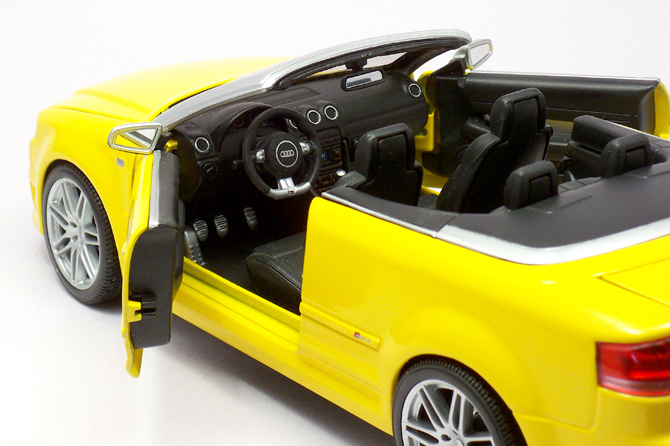 This model features a fully functional suspension, four seat belts and all other general features like functional steering, doors, truck and bonnet open. The under is also decently detailed with the exhaust system fully finished in chrome. The engine detailing is nice and its here where the logo and badging fits very well. The addition of red for the case dint managed to do any good though the white fluids can does create waves. I consider this as a good budget model but for serious collectors this wont work! The sad news is only Maisto makes this in this color so I made a huge compromise with quality for this model. 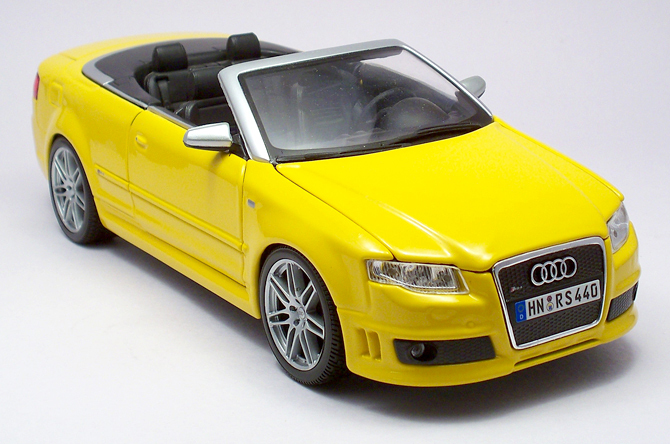 Frankly speaking this model does what it is indented to do – Satisfy the budget conscious collectors desire for an AUDI RS4 Cabriolet in yellow. Thanks, It indeed is a very good model! GO get it..